The Universitat Politècnica de Catalunya · BarcelonaTech (UPC) is a public institution dedicated to higher education and research, specialised in the fields of architecture, engineering and technology. Windcrete is a spar type floating substructure designed to carry wind turbines of up to 10 MW in deep offshore marine environments. The biggest innovation of the concept is the usage of prestressed and reinforced concrete in a monolithic structure, this results in many benefits such as the reduction of the production costs, the increase of life expectancy over 50 years and the decrease on the operation of maintenance thanks to its strong durability in marine environment. Windcrete’s smooth geometry provides durable and reliable stability and in addition the removal of joints allows for simple formworks and facilitates the insertion of reinforcement. Thanks to its hollow structure it can be produced on shore and carried floating to the desired location for installation. Its structure also permits controlled floating to be used to erect it and install the wind turbine at low heights, resulting in the abolition of big floating cranes that usually impact largely in the installation costs. After being positioned, the water in the cavity is replaced with ballast aggregates; thereby increasing its hydrostatic stiffness and stability up to the point that no active control systems are utilized. Windcrete uses a mooring system that handles the various marine and weather conditions it can be subjected to in a deep offshore environment. 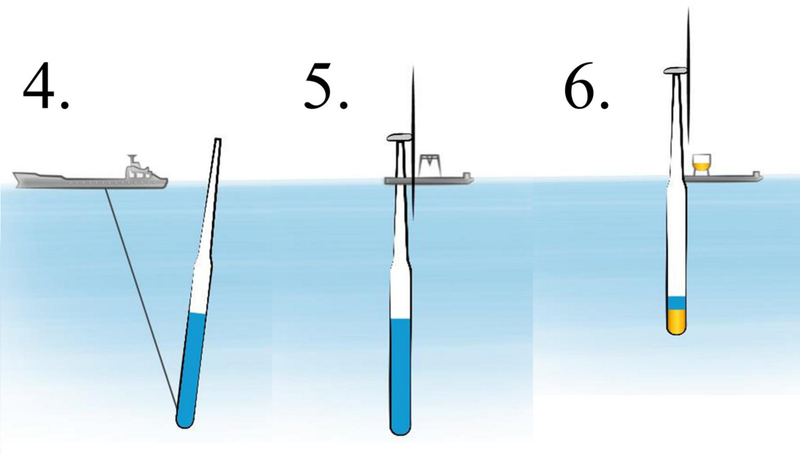 Being a floating platform the first benefit is the opportunity to position the wind farm in deep water where fixed foundation can not be competitive, this would results in a growth of the exploitation of the wind power present in the ocean environment, conducting to a bigger power production from renewables in the country installed. In addition to this a concrete spar, compared to a steel one, cost roughly one third, lasts twice longer and can have a positive impact on regional economy due to the fact that concrete is typically more locally produced and requires less skilled labor. Moreover from the O&G platforms is known that concrete is almost free from maintenance operations and this fact contribute to reduce the O&M costs. The simplified construction and installation processes lead to the possibility of using less sophisticated machinery. As a result of all the above mentioned facts the CAPEX and the OPEX are dramatically decreased and along with them the LCOE which has been estimated to be 0.12 €/kWh. The technology is not showing any kind of limitation so far. 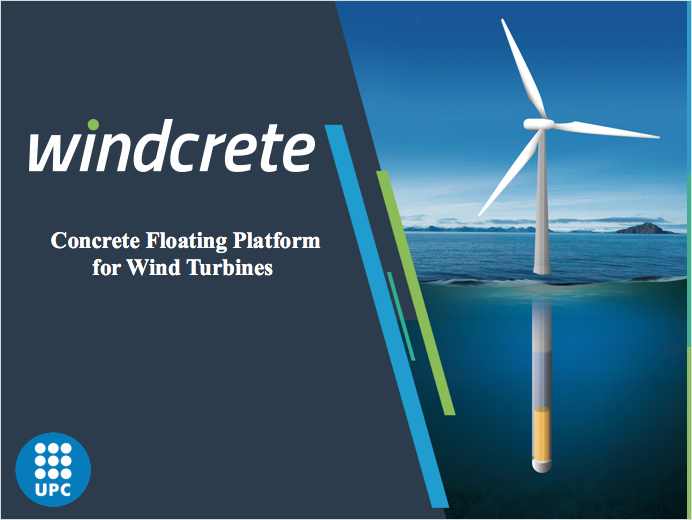 The problems of the traditional offshore wind turbines, such as depth of the sea and weight of the rotors and blades, are avoided thanks to the fact that the platform is floating and made of concrete. The unique limitation is that a prototype need to be built. Since concrete structures can handle large amount of loads, Windcrete is ideal for large scale turbines. A 10 MW turbine can be installed and this would lead to a large production of electricity.